This is my son. It pains me as a mom to watch my son go through feeling so left out at family get togethers, however, I don’t know what more to do for him. I’ve encouraged many family members to try harder to learn a language that could help him feel more included all the while realizing that they may use this new language one or two times a year. My husband and I have both taken turns to interpret when needed, but it’s not the same as direct access to communication–and who wants your mom a part of the nerf gun fight with all the cousins? So I take delight in the fact that there is a place where my son can go to feel connected and a full participant–with others who use American Sign Language. We encourage and take part in his comfortable, communication accessible world as much as possible to let him know he is not alone. It is in that deaf community that we understand how he feels in the hearing world, and we don’t mind one bit. Wow, mom. Yes this is exactly how I feel. I love my cousins, aunts, uncles and my grandparents, but when we have get togethers, it really is hard for me. I want to join in but get lost in almost every conversation and I just don’t want to bother anyone and ask to repeat for the third time. Uncle Greg and I will go out on the porch or in the basement just to find someplace quiet so that we can talk one on one. I like that he does that for me. It does sadden me sometimes that all my family members don’t know how to sign. 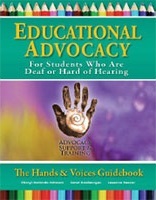 I am glad I have the deaf community. I enjoy being able to talk for hours without having to stop to repeat. It just feels so free.